1. In a large bowl, combine first 4 ingredients. Add the gluten and 1 cup of the flour, along with the yeast, and stir to mix. Add remaining flour and knead to make a soft dough. (Add additional flour if necessary during kneading. Alternately, if you have a bread machine, you can put the ingredients in the pan in the order listed and use the dough cycle. Skip to step 3 if using your bread machine! Put your dough into a bowl, lightly oil the top, and cover. Set in a warm place to rise, until almost double (about an hour). I like to turn my oven on for a minute or two, then turn it off, and let the dough rise in there, since our house is cool.Punch dough down and turn onto a lightly floured surface. Using a sharp knife, cut dough into 8 equal pieces. Form each piece into a ball. On a lightly floured surface, roll each ball into a 6- or 7-inch circle. As you roll the rounds, set them aside on a lightly floured countertop or table, and cover loosely with a towel. Let rise for about 25-35 minutes, until slightly puffy. (The rounds will still be thin though! Preheat oven to 500 degrees. Place 2 rounds, side-by-side, onto a wire rack, such as is used for cooling things. Place rack in the middle of the oven. Bake for 4-5 minutes, until puffy and just slightly browned. (If bread is too browned, it will be dry and not pliable. Remove rack from oven and immediately wrap/layer pita breads in a damp towel, to soften. Continue baking the remaining breads, layering them between damp towels as soon as they’re baked. Allow breads to completely cool. 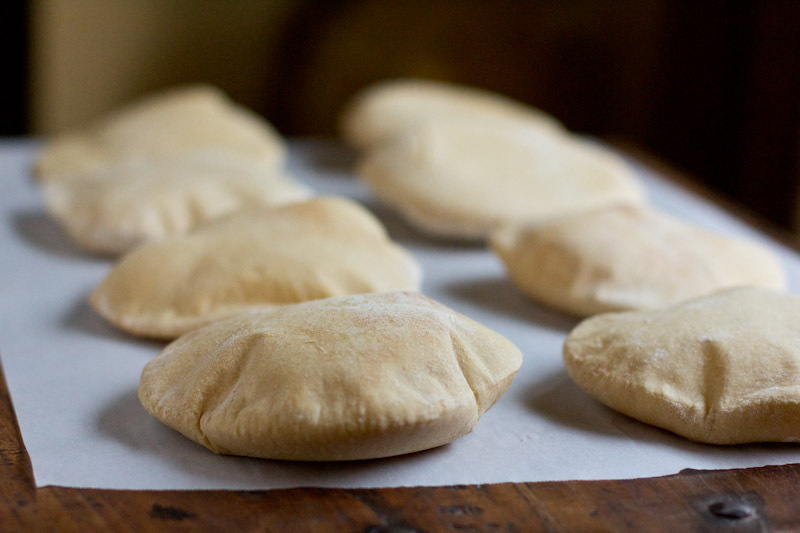 Cut pita breads in half, or split the top edge, and fill as desired. Store pitas in a plastic zipper bag in the fridge for a few days, or place in the freezer for longer storage. 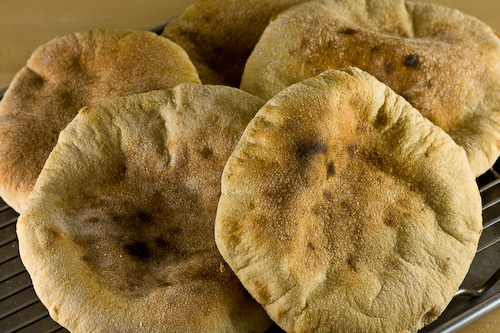 To re-warm pitas, wrap them in a damp towel and then wrap in foil. Place in a warm (200-250 degree) oven for about 20 minutes.